The library contains two cafés and a 250-seat performance space. Since its opening last December, it has become a cultural hub for the city. 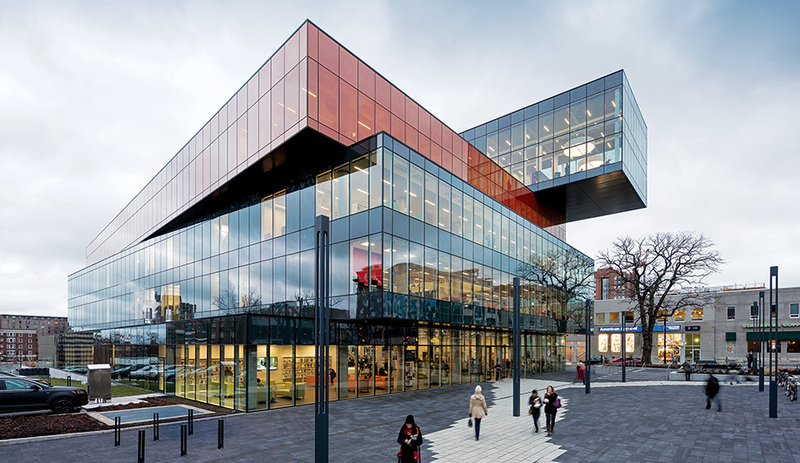 The Halifax Central Library, designed by Copenhagen’s Schmidt Hammer Lassen, is a shimmering beacon for the digital age in a coastal city craving urban sophistication. The maritime city of Halifax is serene and visually conservative. Its verdant residential streets are lined with century-old craft houses, its downtown filled with nondescript buildings from the 20th century. 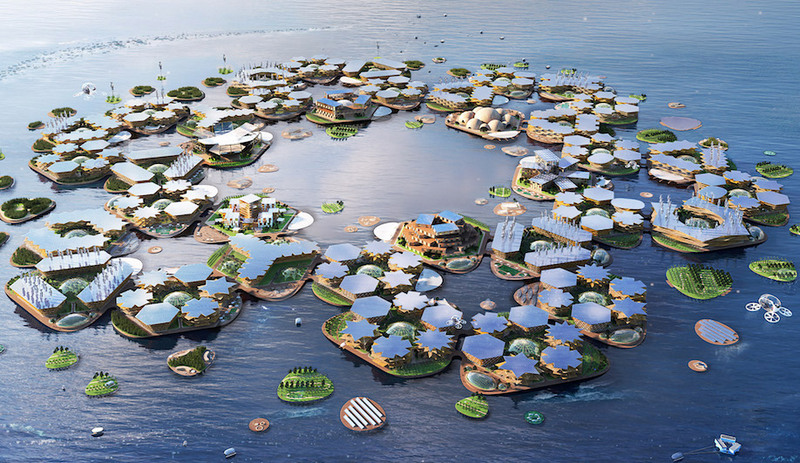 It’s also a progressively modern urban centre, though, teeming with students, professionals and other information- and innovation-minded citizens. So it’s no surprise that it was overripe for a deftly designed, emphatically contemporary municipal library. 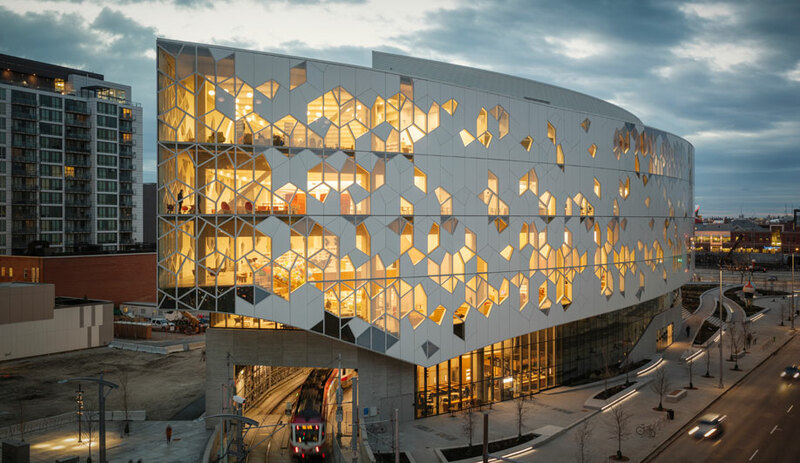 The Halifax Central Library, opened last December, is just the latest in a string of libraries by Schmidt Hammer Lassen of Copenhagen; the firm recently opened another in Edmonton and is now topping off four more in China and across Europe. In Halifax, the building marks a new era, where a quiet vernacular was just waiting for a landmark to winch it into the here and now. 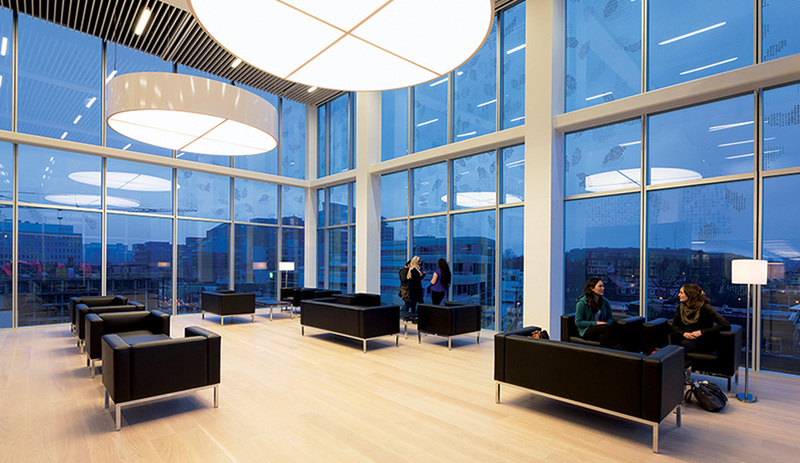 The building’s glazed volumes are oriented toward maximizing views of the city and harbour. At a casual glance, what looks like simple massing is in fact a subtly complex network of strategies that unfold as you walk through the space. The top floor reaches out like the craning head of some Lego-block beast, with load-bearing columns that stand just inside the curtain wall, reinforcing the stacked volumes’ sleek geometry. To locals, the corner building, designed in collaboration with local firm Fowler Bauld & Mitchell, resembles something less intimidating: a pile of gargantuan books stacked four high. Each level aligns with the street and the obliquely angled site of the old library. This is a city that privileges the view from the historic vantage point of Citadel Hill, and the positioning of the glazed slabs has been calibrated to preserve the view plane from the Hill to the ocean. 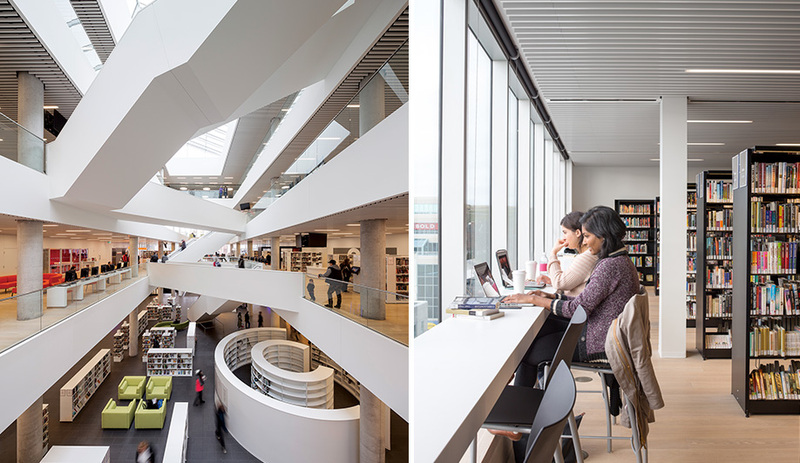 Six staircases and catwalks criss-cross the atrium at the core of the library. 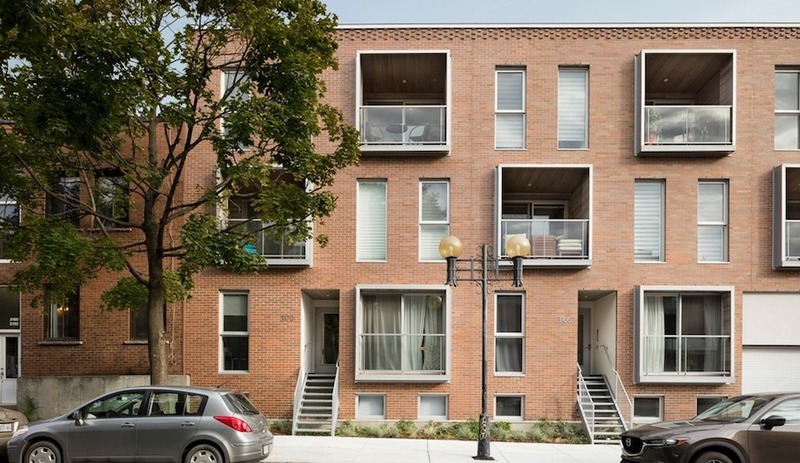 While the exterior is artfully skewed, the interior is seamlessly unified. 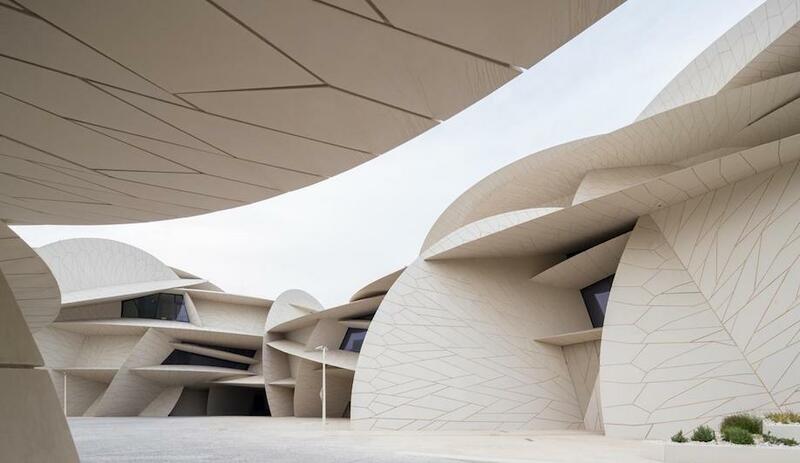 The ground level offers a breathtaking vision of Pirenesi-meets-purism, with an array of six white staircases and catwalks that criss-cross the soaring atrium at the core. It is saturated with light from the pitched linear skylight and punctuated by injections of orange and lime green. 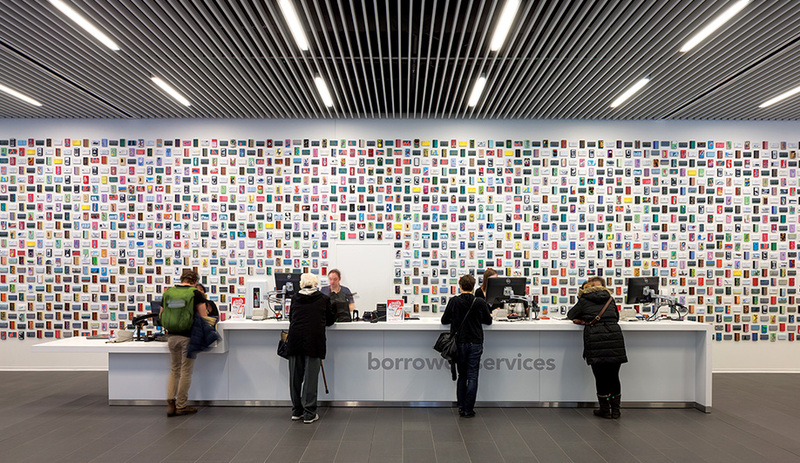 Mounted behind the main desk is Winnipeg artist Cliff Eyland’s installation of 5,000 miniature paintings, each the size of a library file card. In keeping with the new paradigm of contemporary libraries, books aren’t a big deal here, and there is little shelving to clutter up the space. E-books, video games, recording studios and other digital offerings are the main products on hand, along with ample social areas. The upper floors belong to kids’ spaces, adult literacy, First Nations cultural programming, a reference department and gobsmacking views.